DONG Energy has signed a lease for construction base facilities at the Cammell Laird site in Birkenhead from Peel Land and Property. The base will serve as the focal point for the construction of the Burbo Bank Extension, DONG Energy's latest offshore wind farm, in Liverpool Bay. It is expected that the site will employ up to 50 people, with the UK supply chain further boosted by contracts for production of key components. This will include turbine blades manufactured on the Isle of Wight, production of foundation transition pieces in Teesside, and onshore substation work being carried out by UK companies Balfour Beatty and Jones Brothers. DONG Energy is leasing the construction facility from Cammell Laird, who in turn leased the 6.5 acres site from Peel Land and Property. The process of staffing the site will begin immediately, in preparation for the beginning of offshore construction for the wind farm due in the summer. Onshore construction got underway in 2015. Burbo Bank Extension Project Director, Claus B�jle M�ller, said:- "This is another step forward for both Burbo Bank Extension and UK offshore wind. The facilities in Cammell Laird are of the highest quality, and having been used for similar purposes before, will allow us to efficiently handle the construction of the wind farm as we move towards offshore work. We are pleased to be located in Birkenhead and look forward to working within the community." Liza Marco, Asset Manager for Peel Land and Property, also added:- "Peel is at the forefront of delivering low carbon energy across the UK and we are therefore delighted to work with the renewable energy sector through Cammell Laird, who continue to grow their business in the sector, and DONG Energy, a leader in UK offshore wind." The construction base will initially service the installation of offshore elements of the Burbo bank Extension project. Burbo Bank Extension offshore wind farm will be located in Liverpool Bay, 7km from the shore. Once completed, the wind farm will have a capacity of 258 megawatts, enough electricity to power 230,000 UK homes. 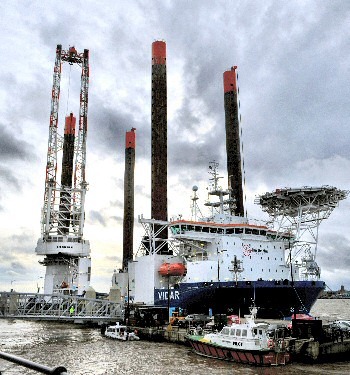 The specially designed heavy lift jack up vessel Vidar, is 1 of the craft that will be used on the Mersey to do this work. Pictured hear you can see the long, lattice legs it will use to jack up with when installing the wind farm turbine towers. The ship VIDAR was built in 2013 and was formerly operating for the German company Hochtief. VIDAR has an overall length of 140m a width of 41m. Her gross tonnage is 18,886 tons. She has a a main crane around one leg that has a lifting capacity 1,200t at a maximum radius of 27.5m. We are told that its working load limit is about 1,500t. 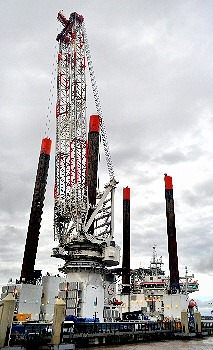 The maximum wind speed for operating the crane is 18m/s. The vessel also has a helicopter deck with a diameter of 20.88m, that can land a Sikorsky S92 with a maximum take off weight of 12.8t. The triangular lattice legs on the vessel use a rack and pinion system to go up and down, with a jacking speed of about 0.83m per minute. this system lets the vessel work safely in rough seas.